Virospack has developed a new concept of packaging from a technical, marketing and functional point of view. 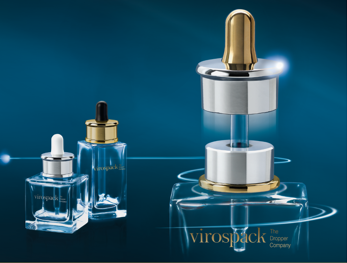 Virospack's original dropper has been fitted with an exclusive and patented system of magnets whereby the attraction of the two poles removes the need to twist the pack open and closed, therefore eliminating the need for a screw neck. The new packaging concept comprises of a dropper and a clip on a bezel that fits all FEA 15 vials on the market. The new magnetic dropper is composed of two pieces that contain a special combination of components for an innovative, functional, safe and, of course, customizable final result. Both parts of the dropper feature a magnet with poles that produce an attraction to the other in order for the dropper to close the vial. The dropper can be easily opened by simple rotation as the movement aligns the same poles and causes the dropper to separate from the vial with little effort. Dropper: The visible part of the dropper cap can be painted or metallized and incorporates a pipette and a rubber bulb. Neck cover: The neck cover is a bevelled embellisher and in addition to its shoulder-cover function, it also acts as a wiper for the dropper pipette. Virospack's innovative magnetic dropper can be easily adapted to many vials on the market as FEA 15 is one of the most commonly used cosmetic bottle necks. The new dropper is innovative, easy to adapt and, as all of Virospack's products, customizable. Both components can be decorated using different techniques in order to create a personalized magnetic dropper. With two pieces visible —the aluminium cover and the plastic collar-drainer which protudes Ø through the bottom of the aluminium— metallization or colour injection can be used to create a variety of looks. In addition to offering a wide range of decoration techniques, Virospack has also created two different cover options for the magnetic dropper to increase the options available to its customers. While magnetic attraction is a consolidated trend in cosmetics, Virospack is the first company to present its use for skincare.